Simply put, this is a creativity competition. We look for students who like to think”outside of the box” and enjoy showcasing their talents. There are two parts to this competition: Long term and Spontaneous. 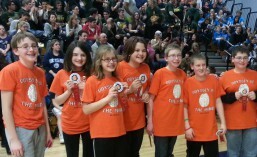 Click here for OM Fact Sheet, or view this introduction video directly from Odyssey of the Mind! LONG TERM: Each year, teams are presented with 5 problem choices. They are to choose one and present their solution at competition. The solution is presented in the form of an 8 minute skit to be performed at competition. Teams are formed by 5-7 students and at least one coach. (Assistants are welcomed and encouraged!) Coaches must have all volunteer clearances. Early in the year, teams meet once a week for approximately an hour, depending on the age of the students. Through the course of the year, they will be responsible to create their skit in any appropriate way they wish. Any of the features of their presentation must be “kid made.” What this means for a coach is that they may ask the team questions and help them create ideas, but cannot tell them what they should or need to do. This includes props and costumes – all must be created by the students. If a coach deems an idea unsafe or impossible for them to do on their own, the team must find another way.